კვლევა | Age Dynamics of Volume and Character of Emergency Medicine Concerning Ear, Nose and Throat (ENT) Diseases. >> Investigation of the quality and volume of emergency medicine in case of ear, nose and throat diseases carried out by linear brigades showed that there existed mean errors (inadequate assistance, ungrounded arrival at the hospital, etc.). Therefore, we consider functioning of specialized ENT-brigades under first-aid stations of large cities (one twenty-four-hour brigade per 2 million people) very necessary. ექსპერტის შესწორებების თანახმად განისაზღვრა ყელ-ყურ-ცხვირის დაავადებებთან დაკავშირებული აუცილებელი გადაუდებელი ჰოსპიტალიზაციის სიხშირე. გამოთვლები, საავადმყოფოში პაციენტების მკურნალობის საშუალო პერიოდის დონის გათვალისწინებით, გვიჩვენებს, როგორც საწოლის დაკავების კოეფიციენტს (5 ან 300 დღის შესაბამისად) ყელ-ყურ-ცხვირის დაავადებებთან დაკავშირებული გადაუდებელი ჰოსპიტალიზაციის მიმართ მოსახლეობის მოთხოვნის სრულად დასაკმაყოფილებლად, საჭიროა 0,20 საწოლის დაგეგმვა 10 ათას მოსახლეზე. ყელ-ყურ-ცხვირის დაავადებების შემთხვევაში სწორხაზოვანი ბრიგადების მიერ აღმოჩენილი გადაუდებელი სამედიცინო დახმარების მოცულობისა და ხარისხის კველვამ გვიჩვენა, რომ არსებობს საშუალო დონის შეცდომები (არაადექვატური დახმარება, უსაფუძვლო ჰოსპიტალიზაცია და ა.შ). ამდენად, ჩვენ აზრით დიდ ქალაქებში (ერთი ოცდაოთხსაათიანი ბრიგადა 2 მილიონ ადამიანზე) მეტად აუცილებელია ყელ-ყურ-ცხვირის სპეციალიზირებული ბრიგადების ფუნქციონირება პირველადი დახმარების პუნქტებში. ﻿Efficiency of treatment and postexposure (secondary) prophylaxis of complication of ear, nose and throat diseases depend on prompt and adequate emergency medicine.1,2,3,4,5,6,7 The main volume of emergency medicine falls on first-aid station, but its essential part is provided by ambulatory-polyclinic and stationary medical facilities. The investigations have been carried out at the base of treatment-prophylactic facilities of Baku city. Statistical observation unit was visits concerning ear, nose and throat diseases requiring emergency medicine. Study analyses have been carried out retrospectively on the basis of primary accounting documents. The calculations showed that average annual number of visits concerning ear, nose and throat diseases per 1000 people made: 32,68 in first-aid stations, 5,52 in ambulatory-polyclinic facilities and 6,54 in reception department of medical institutions. The main nosological reasons of visits were nasopharynx and throat diseases (29,54%), inflammatory pathology of nose (26,93%), bleeding (13,45%) and foreign body and trauma of ENT-organs (4,98 and 7,33 accordingly). Acute laryngitis (8,74%), vasomotor allergic rhinitis (7,33%) also were particular reasons for visits. Share of the rest pathologies was very low (0,72% – furuncle and carbuncle, 0,96% – peritonsillar abscess). Visits frequency depending on age is shown in the table. As seen from these data, it is obvious that the main tendency of age dynamics is the growth of appealability in connection with age-related increase, a slight deviation from general trend is observed in the ages 20-24; 30-34, 70 and upwards. 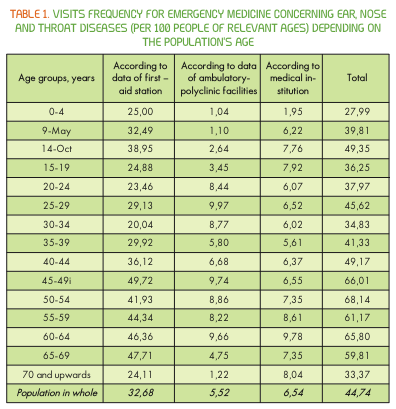 According to emergency indications of ambulatory-polyclinic facilities the visits frequency made on average 5,52% which also depends on the age. Minimal size (1,04%) was 0-4 years in age interval, and maximal size was 25-29 years (9,47%) in age interval. Appealability of age increase in 0-29 years age interval is rectilinear, interval relative stability of visits frequency is peculiar for 30-64 years age. Pursuant to materials of reception departments of hospitals appealability for emergency medicine concerning ear, nose and throat diseases made 6,54 per 1000 people. Minimal visits frequency was in the ages of 0-4 years (1,95%). For the rest age groups the size of indications was high and relatively stable (5,61-9,78%). Average annual level of urgent (emergency) hospitalization concerning ear, nose and throat diseases made 1,08 per 1000 people. Indication of the age dynamics did not have any obvious tendency to growth. Minimal frequency of hospitalization was observed in 0-4 years age interval (0,32%). The greatest indications were recorded in age intervals 5-9 (1,79%), 10-14 (1,85%), 55-59 (1,57%) and 60-64 (1,88%). In the rest age intervals the level of hospitalization were intervals, and fluctuated within the limits of 0,73-1,30%. On average the frequency of planned hospitalization was 3 times greater. Investigation of nosologic structure of reasons for hospitalization of infant population showed that the main reasons are inflammatory ear diseases (50,5± 0,94%). The share of foreign bodies and bleeding of ENT-organs made accordingly 4,51±0,39% and 2,1±0,27%. As per expert appraisal, it was defined that the level of actual hospitalization of infant population is on average 1,37 times lower than necessary level. In nosologic structure of hospitalization of adult population 19,6±0,54% made inflammatory ear diseases, 12,6±0,45% inflammatory diseases of throat, 4,3±0,27% – - trauma, 4,1±0,27% – bleeding, 1,2±15% – foreign bodies of ENT-organs. According to the experts’ conclusions the actual level of hospitalization of adult population on average was 1,3 times lower than its necessary level. Distribution of hospitalization events concerning ear, nose and throat diseases according to its character (planned and emergency) showed that the shares of emergency hospitalization of infant and adult populations relatively are closer (22,3 and 25,4% accordingly), though nosologic reasons of emergency hospitalization differ considerably. The main reasons of emergency hospitalization of infant population were inflammatory ear diseases (54,1± 1,97%), foreign body (20,1± 1,59%) and bleeding (9,4± 1,16%) of ENT-organs. The shares of inflammatory throat diseases (19,2± 1,1%) and ear diseases (17,9± 1,0%), trauma (16,9± 1,0%) in the structure of reasons for emergency hospitalization of adult population were relatively closer to each-other. Pursuant to the expert’s amendments, frequency of necessary emergency hospitalization concerning ear, nose and throat diseases which made 15,2 per 10 thousand infant and 10,3 per 10 thousand adult populations (on average 11,5 per 10 thousand population), has been defined. Calculations show that taking into consideration the level of a middle term of treatment of patients in the hospital, as well as bed occupancy rate (5 or 300 days accordingly) for full satisfaction of population’s demand to emergency hospitalization concerning ear, nose and throat diseases, it is necessary to plan 0,20 beds per 10 thousand population. Investigation of the quality and volume of emergency medicine in case of ear, nose and throat diseases carried out by linear brigades showed that there existed mean errors (inadequate assistance, ungrounded arrival at the hospital, etc.). Therefore, we consider functioning of specialized ENT-brigades under first-aid stations of large cities (one twenty-four-hour brigade per 2 million people) very necessary.